If you follow the `Essex` meridian line down until meeting `our`Barrancabermeja`s Colombian latitude, it is in Ghana so a good enough reason to choose it for a winter tour, no? After 17 weeks cycle touring in Colombia, Sweden and Austria last year always in our comfort zone, Ghana is certainly out of our comfort zones. 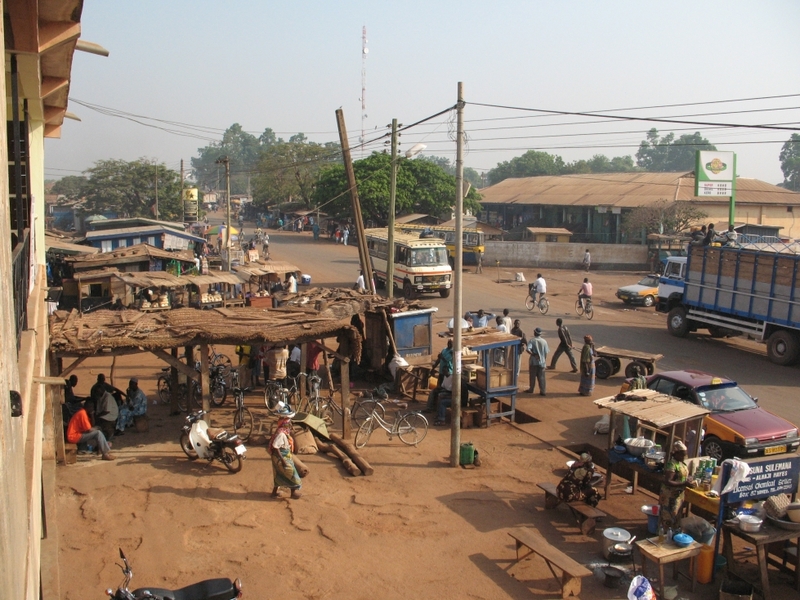 Temps between 35 and 40, loose tummy, no proper food, perhaps our ageing too are the downside to very friendly Ghana folk. The first 6 days have been as hard as we can remember, certainly harder than the Guatamala highlands or the 75 miles a day on the Colombian end-to-end. Here is a flavour of those 6 days. Jan 5th, 36C at 12am- the first 10 miles were on a cycle path separated from a dual carriageway with small businesses lining the road. The road then rose at 5 – 11% for a few miles to Aburi where no proper food! 6th. Incessant villages sprawls, ups and downs 5-10% all day, Anni hit on buttock by a wing mirror, but the driver at least stopped to apologise.Scrub, bushes and isolated trees. I had been reading about London-Edinburgh-London and our days seemed to be so similar- ride-eat-ride-eat-sleep a bit-ride. 7th A very dusty hard shoulder with lots of rumble strips. sleeping policemen.Cacti on roadside, hills to north an south. Again, 34 miles took all day, we are so slow. 8th. Rolling road territory but at end of day a long 11% hill to walk up.In addition, we cannot accurately find out about ferry times across Lake Volta and how near we can stay if there is only the one (10.00 am) ferry. 9th. Anni restrained on 2 separate occasions by young men wanting to know `where we are going?` We hear about a place to stay 20km from the ferry but no-one answers the door, so a neighbour telephones someone. We continue but there is no habitation, nowhere to stay just mud huts, no food, a long way back to Mpraeso if we are isolated at the water`s edge. A big car arrives with 4 burly guys who invite us to return to their guest house. No thanks , we continue downhill along a dusty wide road, no traffic ( perhaps we have missed the ferry?) to the ferry just in case there is something but the 10am, the 1230 pm has gone and there is another in an hour at 2pm but there are some wooden open boats waiting for 4 passengers, so in we go with our bicycles. Nowhere half decent to stay on the other side so 15km in searing heat 40C but flat . Plus slash and burn roadsides keep us cosy! I think its the second day eating only biscuits. 10th. 39C at 12am. A flat dusty road , often a sandy piste, washboarding, loose sand / stones and again the slash and burn! Birdlife and bushes make for the interest. However, flat. At the end of the day, Anni sat wearily on the road waerless, fed up and whacked, but at Donkorkrom we find a restful Guest House in a garden and decide we have earned a few days rest. Longest day so far 38miles. 4 days of loose tummy begins! The second week began after 2 lovely rest days in Donkokrom , walking in the woods, attending church and meeting a 74 year old lively, retired? Irish mission sister. It was then an early start for the 15 miles to the 10am? `engine boat` back across Lake Volta, slipping and sliding on loose sand and even being hit from behind by a motor bike ( 3 people) that fell over, it was also slipping and sliding along like me. A bit like dual slalom! At Hohue it was decision time, whether to carry on northwards on rough roads and places to stay probably 100 km apart. a no brainer really so it was turning east and a nice visit to Wli waterfalls, one of Ghana`s big attractions, consequently folk a bit aggressive and wanting `money` .A German guesthouse owner said we would not make Ho in a day (120km) and recommended a Mountain Pleasure resort but grubby carpets and bathroom were too much for us so at 3pm it was head downhill(ish)through tree lined country- side and even a rain shower and full speed the 36km to Ho where we did arrive before dark and found a nice hotel with delicious steaks. My computer made it 80km. 2 days rest and checked over the bikes. Met USA missionaries and were invited to stay in their guest room, (we give donation), a lovely family with 4 children taught at home, the eldest takes us a walk up to an escarpment isolated hamlet. By now we are acclimatising but its much more humid than Colombia and the mosquito nets etc take patience putting up. The folk continue to be most welcoming and helpful with food and drink. Onwards south to Adidome, moving out of the few hilly escarpments. A split innertube ( faulty Indonesian)just as a beatifully dressed young woman came past on a bike with 2 water cannisters , I did manage a photo and nearby was a roadworks depot to change the innertube . Plenty of cycle repair sheds, wheel builders and even a spare spoke to buy. Mostly flat from now on. At Sogakope , a `worldclass` hotel with a view over the Volta as it widened before the Atlantic Ocean. Good food. Sitting on veranda early morning a treat. Dragoman bus passed us, open windows, a really old strong thing. Wonder if those adventurers are sorry for us or jealous? 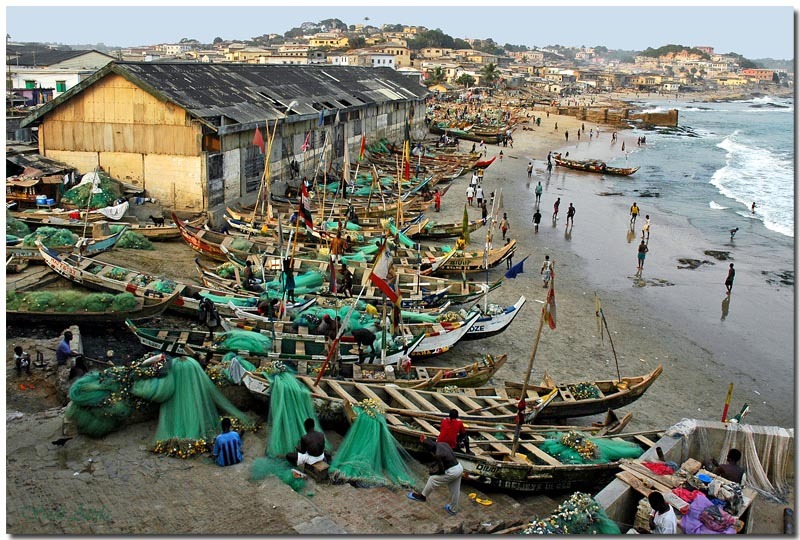 As we were not going north, we then put in an extra loop eastwards to the coast near Togo and found, at Keta, a Guest House by the beach with photogenic fishing boats/ men. On the way, 7 young men on side of road hand loom weaving bright Kente strips, clickety click. Further on drummers, trance – like dancers at some kind of religious or funeral event. In the lagoon, kingfishers, hornbills, plovers, stilts, weaver birds. Here in Ghana, am wearing long ankle sox a la Wiggins, not for performance but at average 8mp could do with that. More to reduce skin cancer risk on shins ( 2 friends suffered seriously). We continue on our `proper holiday along the turquoise Atlantic Ocean, the sand and then the road or something called a road potholes connected with sand of which the most lands on our shins and in the chains. Gosh we have brown legs! Or sand covered!. Cross the Volta Delta on an engine boat, just for us `special` price! Prampram, 6x 60 ft tree trunks hewn out in the shape of the fishing boat hulls on a lorry and on the beach the finishing works going on , quite massive construction. Good for 15 years or so, a snip at £75000. Marvellous to see all the young kids able to walk smartly alone to school. Dressed in clean uniforms, satchels and a polite Good Morning to us always. At one point, on a lonely cul-de-sac along the coast , a Moslem lady in Blackburn Rovers top! As we had just seen them draw with City in the cup 0-0, wev thought of such a sight in Blackburn back home. Eating improving too, octopus, lobster as well as the ocean`s fish. Safer than chicken. Even a gin/ tonic last evening. Going to the west of Accra from Shai bird Reserve and run-down chalets, we got caught in torrential rain on the equivalent of the M25 but fortunately we found a welcoming, excellent Forest View Hotel at North Dzorwulu, not far from the Accra airport. One last observation as we start our second month and are still happy to do so. Most days we are asked our age, but at the last occurrence, a big heavy plant transporter driver, helping with directions shook both our hands 3 times, then embraced Anni, hugged her and then hugged me too. He was a giant (black man). Such unexpected daily happy things are a great delight here in Ghana. Lots of fun as we ride along, cries of `Grandma`,` Grandpa` as they call folks who are past it. *** March summary so far- after a 3- day stay at Asaasi-Yaa, a friendly seaside resort where we have breakfast overlooking the Atlantic, we decided to find some Rough-Stuff Touring and also to avoid the main east west highway so turning west out of the gate onto a hard sandy byway, this soon became a grass- centred track then a footpath, then just grass next to the beach then on to the beach until an estuary which we waded across, fast flowing so gave 2 panniers to 2 young `porters`. The next day more dirt racks but a nice hotel at the end. Then a 3-day diversion to the interior northwards on quiet roads to Oda and back south again, enjoying the cocoa plantations, short hills and a hotel with colourful garden where we ate our evening meal. A few days later another beach track from Ellmina, meanwhile 2 castles to visit and in between a discussion with 3 `suits` with ties in a Security Firm`s big 4 Wheel drive who sat there engine running and wound up the windows when we asked them politely to turn it off . Arrogance in abundance. Another walk on the beach to Besua after a very steep headland track. The African Rainbow was a professionally run hotel, very friendly staff. Later a visit to a castle bought by a Surrey farmer. 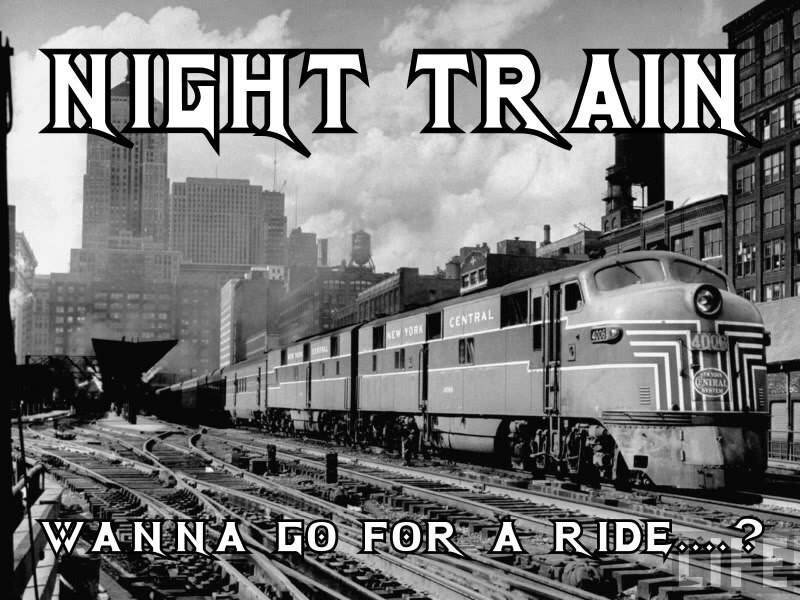 A day to rest up then off again only to be halted by threats of extortion/ protection money on another track that left us further back than when we started! All part of the adventure! Still, in March so far there have been some lovely days on beaches by some of the Beach Resorts where we have stayed, eating only fresh fish ( and chips or rice)from the nearby Atlantic. As a bonus, we have mostly managed to avoid the busy east west highway and are just half a day from the Ivory Coast border. Weather still hot, no complaints there . Now and again a shower but no wet clothes, always somewhere to shelter . One puncture a week to give us a moan! Hi again, what an experience at the frontier to the Ivory Coast , a long straight road that became full of folk selling palm kernels, other fruit and veg plus all manner of goods on both sides of the road,exports/ imports from the Ivory Coast, trolleys moving in all directions and us trying to make progress forwards. Tall herb/ medicine sellers from Niger and Benin. Eventually we came to some closed gates and in the distance, a lagoon, perhaps 2km to the other side. The police, then Customs then Emigration let us pass but we were nervous in case of not being let back in but in the end an officer took us the to the edge of the Quay and we managed a photo. We bought a a mango and avocado for lunch. That was it, our tour nominally ended ,we turned our wheels for home. Just a couple of hundred miles to Accra airport . 3 Days followed with us rolling along in a big gear, hindwind for the first time, then a bus ride and breaking a lifelong taboo when we rode the last kms to our guest house in pitch darkness. Yes, Ghana, West Africa and `The White Man`s Grave` had certainly grown on us. The welcome of the people and the hot weather the real plusses. See you soon, we have evaded the cannibals pot so far! PCW No 4: the first was a private trip in 2004, when I realised what a fantastic route this is. Three CTC tours up the route followed, in 2007, 2011 and the latest, completed a week ago in 2013. 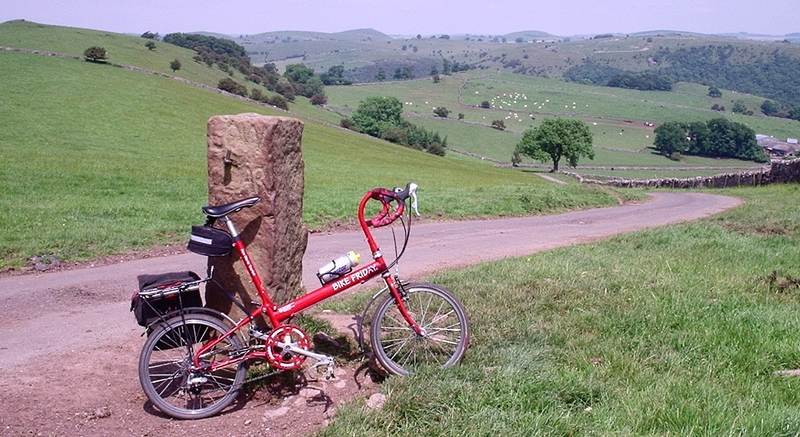 It’s a truly tough ride, and most definitely Sustran’s most challenging route: forget the Lon Las Cymru – kid’s stuff! C2C – hard but short in comparison. It’s got huge variety and there’s beautiful scenery of all kinds, whatever your taste. It takes a few goes at a route before you really get under its skin, and after four goes, I’m beginning to really feel I know this route. Familiarity certainly doesn’t breed contempt however. You just gain more confidence in knowing where the big climbs come. The route hasn’t changed except for the odd little Sustrans addition (so you can be sure it’s yet another off-road section). Do we like the off-road sections? Well, not really, it has to be said. 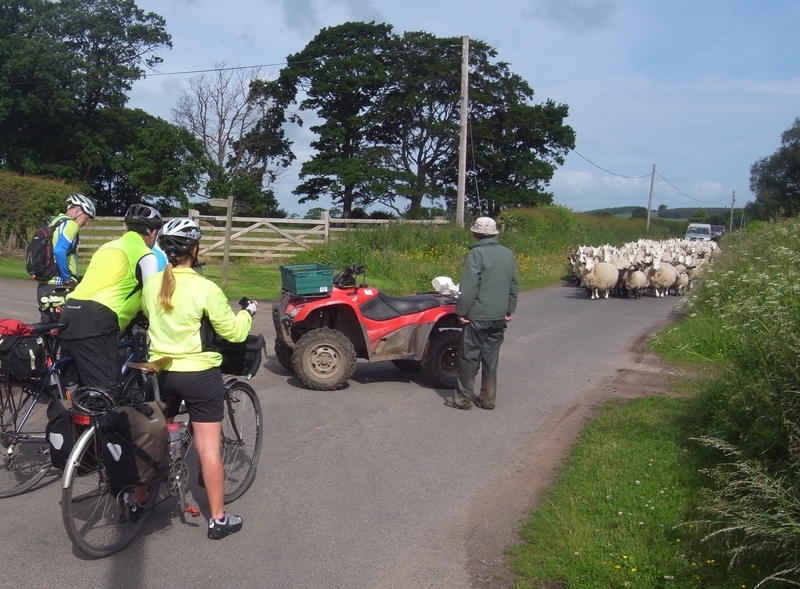 We endure them, knowing that the route wouldn’t really be the Pennine Cycleway without them. This year we were pretty good and didn’t avoid much. 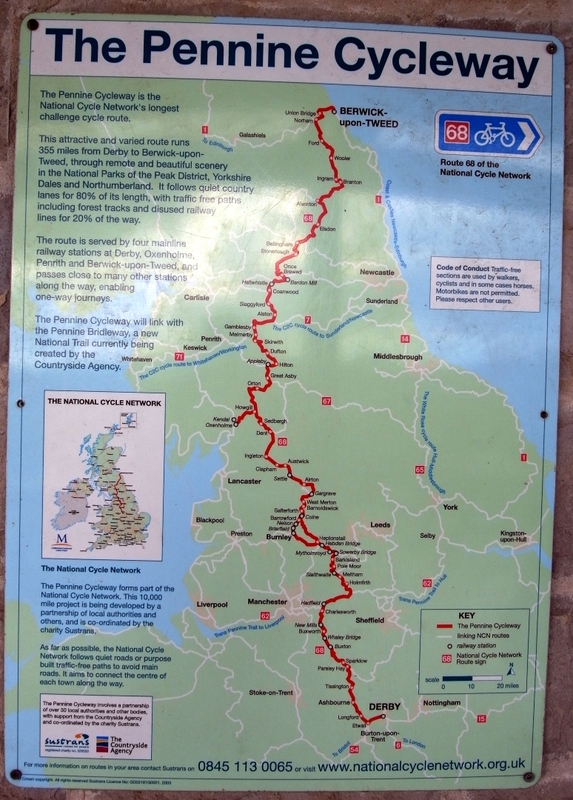 Day 1 (a half day) starts in Derby and follows lanes to Ashbourne (tea stop), where you join the Tissington Trail, a lovely old railway track route. Thankfully the trail was dry-ish so the bikes didn’t get too covered in surface mud, which turns to concrete if it’s not washed off. More climbing once Parsley Hay is reached as one takes to the road again for a few miles to Youlgrave. Day 2 started with a diversion. The Monsal Trail is now fully open and so we decided to use it to get to Buxton. A good decision! It’s well surfaced and goes through some great tunnels. Pity it rained all the time. Buxton provides coffee and the traditional photo in front of the Opera house. A big climb out of the town is followed by the roughest section of trail on the whole route. Fortunately it’s short. 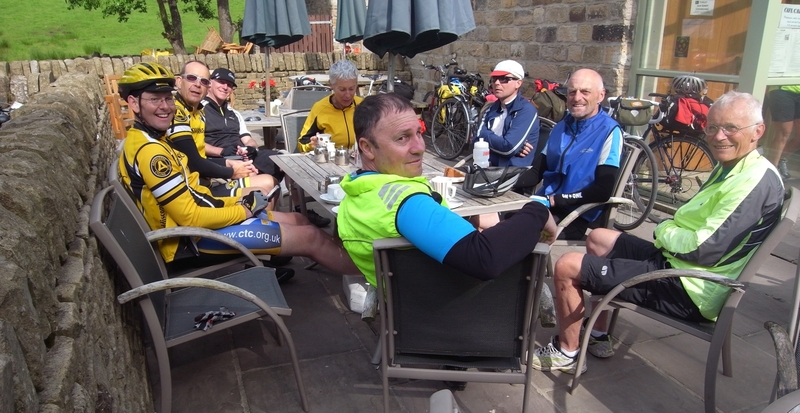 We avoided a few gratuitous lumps by sticking to the main road for a section between Whaley Bridge and New Mills, where we enjoyed a good lunch at the Llamedos Café. A massive climb follows lunch – I’d forgotten about that one! – and then suburban roads all the way to Glossop and the Longdendale Trail. 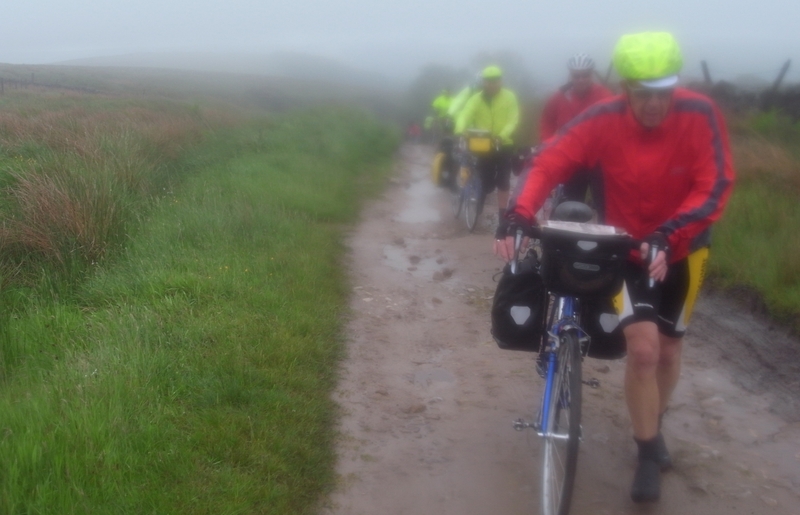 It’s an integral part of the route, being relatively long, but today it was damp and mucky. More bike cleaning this evening, I think. 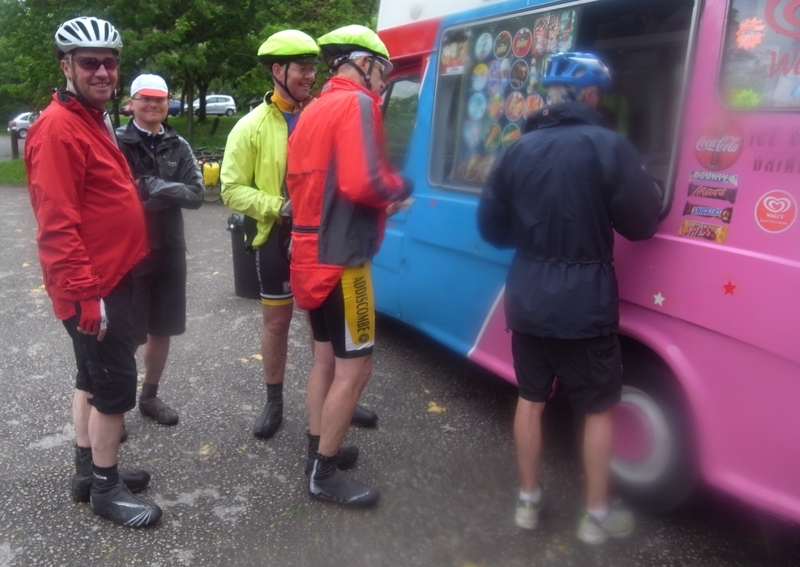 Thank goodness for the ice cream van half way along. It’s a tough day, this, and not over quite yet. 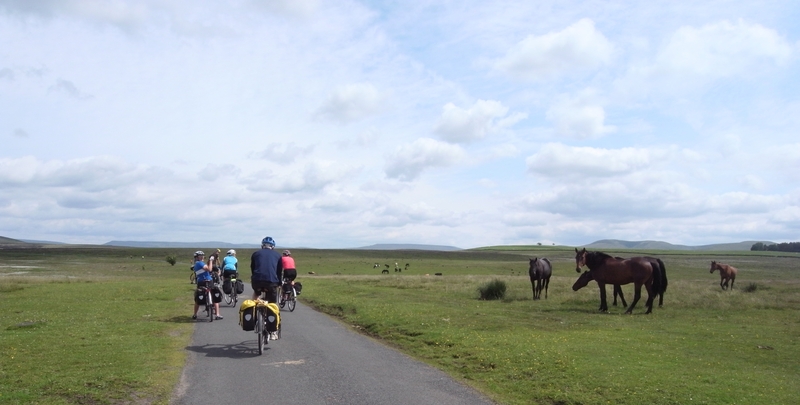 We still had a section of ascending main road to ride (avoiding some off-road trail through moorland). This was the A628 Manchester to Barnsley road. The weather hadn’t been good today, so traffic was quite light and the left turn soon comes. 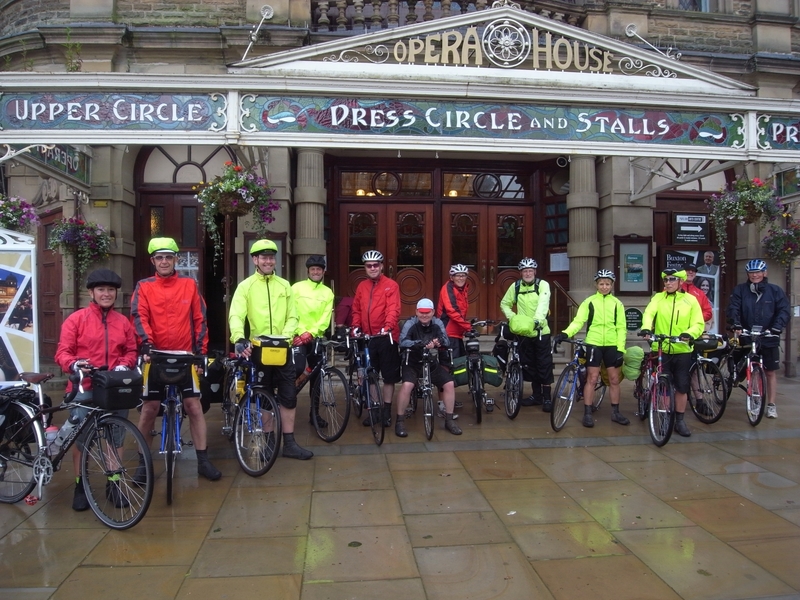 Then its a few fun miles before the mega-descent down to Holmfirth and our most comfy night of the tour. There’s no doubting that the toughest section comes on the morning of day 3. 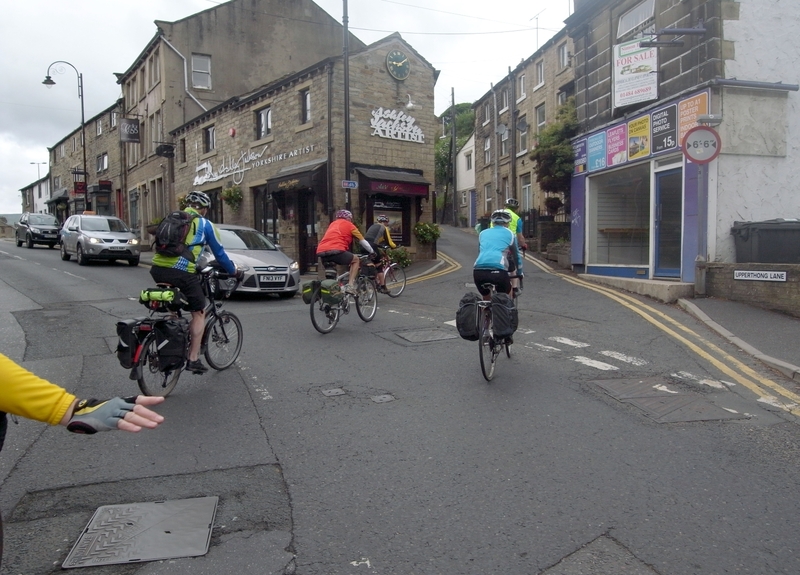 After a huge climb out of Holmfirth, straight after a good hotel breakfast, it’s downhill to Meltham, up again and down again to Slaithwaite where the steepest climb of the whole route awaits. It’s long too. A descent brings the first off road section of the day, past Scammondon Water, a reservoir high in the hills immediately adjacent to the M62. The noise adds to the atmosphere but you quickly long for peace and quiet again. There’s no choice but to push your steed up a nasty 100 yard climb up to the road which, after a few miles will take you vertically down to…. coffee at Sowerby Bridge. Yes, that’s just the first section of the day. 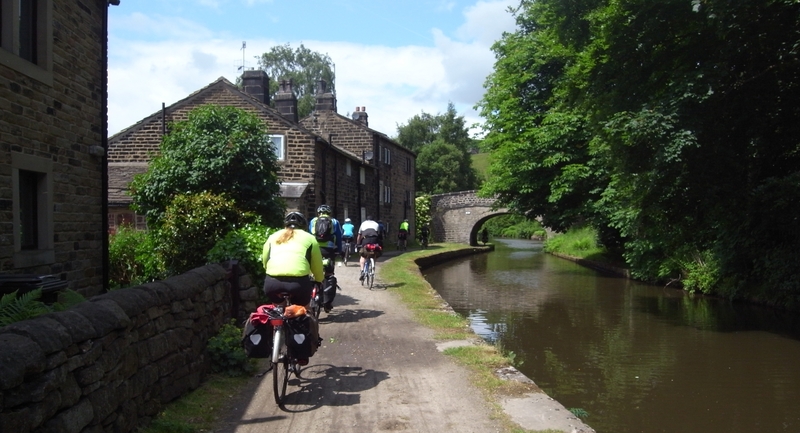 Next comes a pleasant ride along the Rochdale Canal to Hebden Bridge, which has become an arty-farty mecca, but not unpleasant for all that. Getting out of Hebden Bridge involves an awsome grovel up a quarter mile of cobbled steps. How lucky were we that they weren’t damp today, which makes them a nightmare with a loaded bike. Once at the top and back on the road, there is relentless ascent up to Heptonstall village (more cobbles) and through it to, at long last, a flat summit. 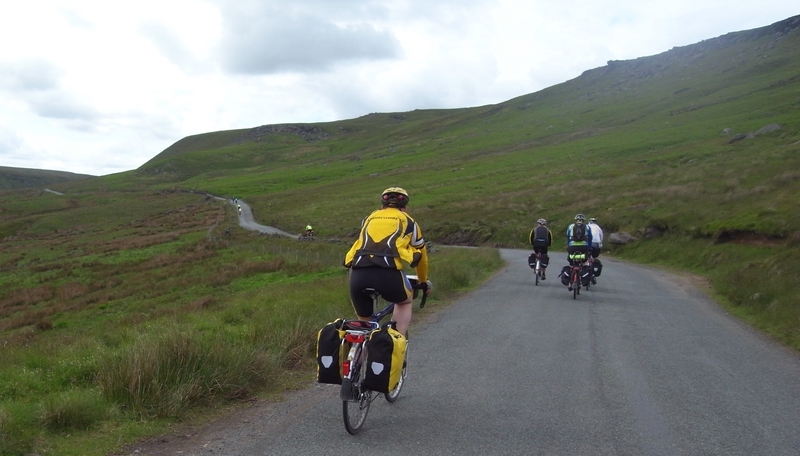 A descent quickly follows on to our first proper bit of wild country cycling – Widdop Moor. It’s a classic bit of northern moorland, full of atmosphere and a couple of nasty steep sections, but mainly a gentle grind up to the top and so down into the Colne Valley. 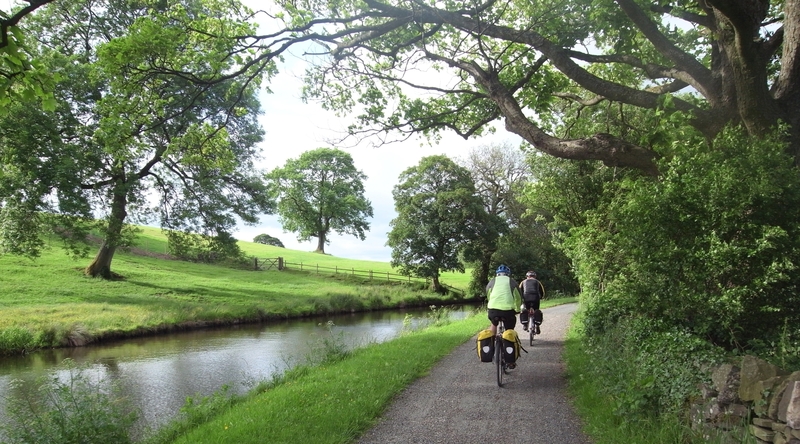 At last, the hard work is over for the day and all we have to do is ride along the Liverpool / Leeds Canal to Salterforth and then do a final few miles to Earby, our hostel for the night. Phew, the worst is over. Yes, honest! Today (day 4) is a fabulous day taking in the Yorkshire Dales, with stops in Gargrave, Settle and Clapham, all with excellent tea rooms! You can O.D. on tea & cakes today! Day 5 is good too, from Ingleton to Dufton. 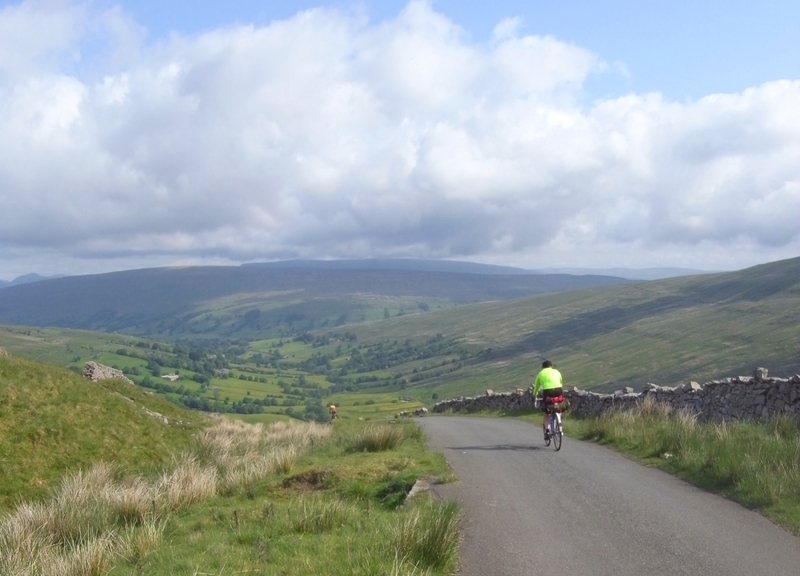 The day does start with a big climb, but it’s typical Cumbrian fell country and you get a great sense of satisfaction when you summit Kingdale and swoop down to Dent along some beautiful lanes. More good stuff follows to Sedburgh, which is a good place for coffee. A climb follows but the lane we follow north, high above the M6 and the West Coast Mainline, is a stunner. Tebay, followed by Orton arrive, with a choice of lunch stops; it’s either a good pub or a café which is part of a chocolate maker – it really doesn’t get much better. 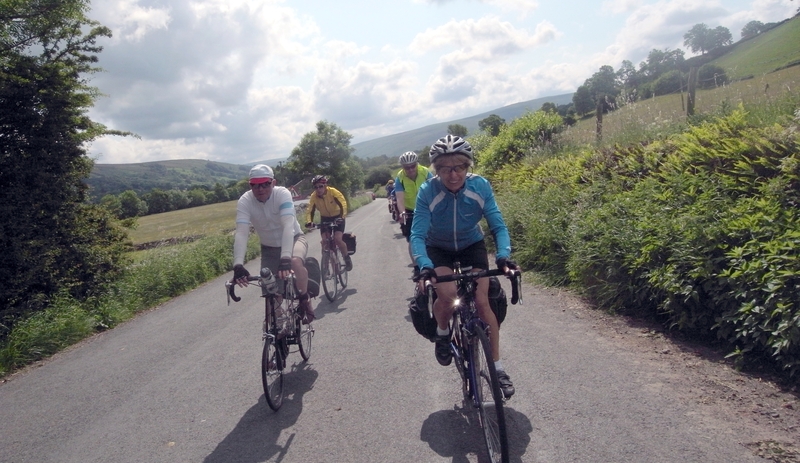 A stunning ride through moorland follows before we arrive in the Vale of Eden and make our way to tea in Appleby-in-Westmoreland. It’s a short ride (mostly uphill!) to Dufton and our night stop. Day 6 starts with a lovely ride along lanes to coffee at Melmerby, at which point you can cut off a little corner and get on the main road here to climb to Hartside. This section puts fear into some people but it’s well surfaced, a gentle gradient and not heavily traficked. The descent down to Alston on the other side makes it worthwhile anyway. The atmosphere changes here, for some inexplicable reason, as we head north, following the river South Tyne. 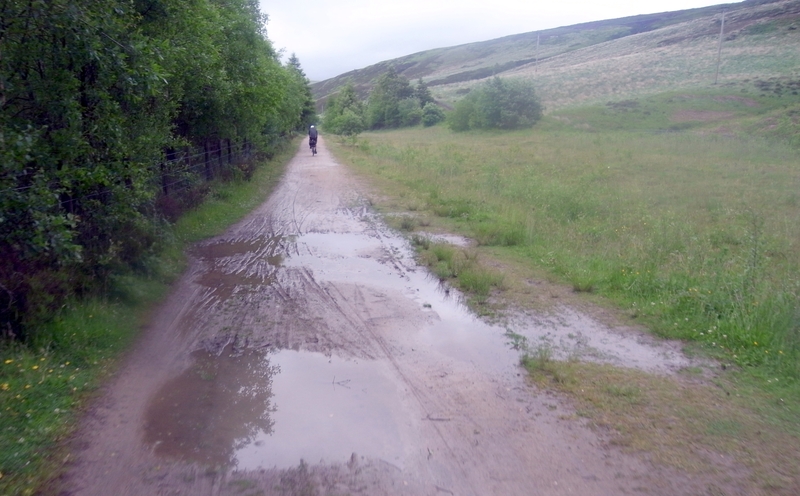 It’s invariably wet on this section which is a shame, because it’s lovely. 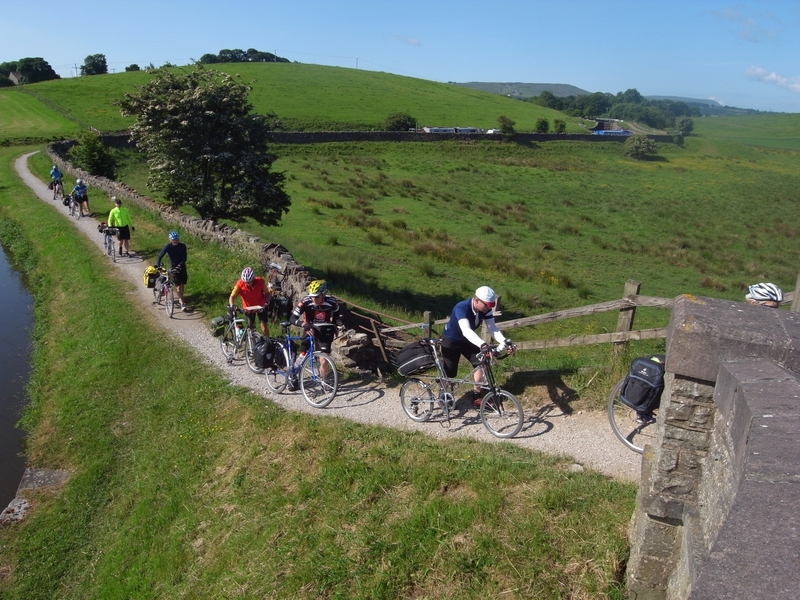 First the challenging lane with some very steep sections, and then the joy of a delightful cycle path all the way to Haltwhistle – almost: there’s one nasty climb needed to avoid the stunning Lambley viaduct, which can’t be accessed owing to the route passing through a private garden. Haltwhistle offers great tea shops at budget prices. Everyone’s in a good mood here because we’re getting there! One more big day and it’s cracked. We can start relaxing. The downside is that it’s usually raining around here and the midges were out in force as we climbed steeply out of Haltwhistle heading north to follow Hadrian’s Wall eastwards. A short flog took us to Once Brewed for the night. Day 7 starts with more ascent up through the Wall and after six or seven miles we reach the Wark Forest and the longest section of off-road trail. The fact that it was raining didn’t help and there were definity some in the group who would happily have avoided Wark, but it wasn’t discussed. 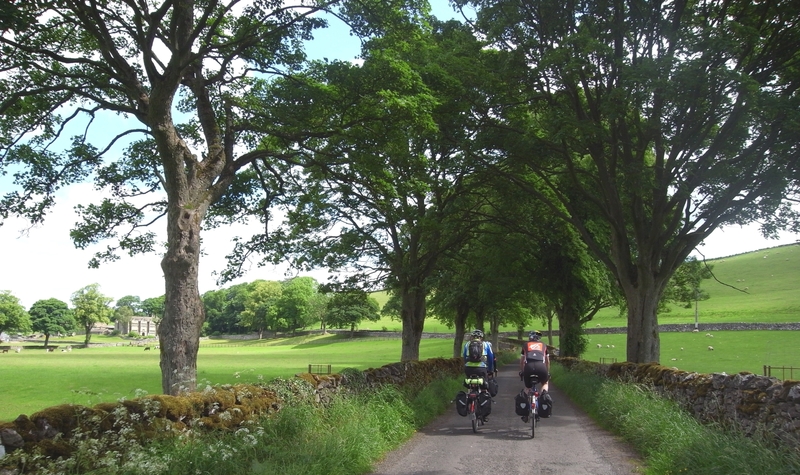 It’s soon over and tarmac returns, and some very attractive, remote Northumberland scenery helps the miles go by. Bellingham brings coffee and Elsdon lunch. 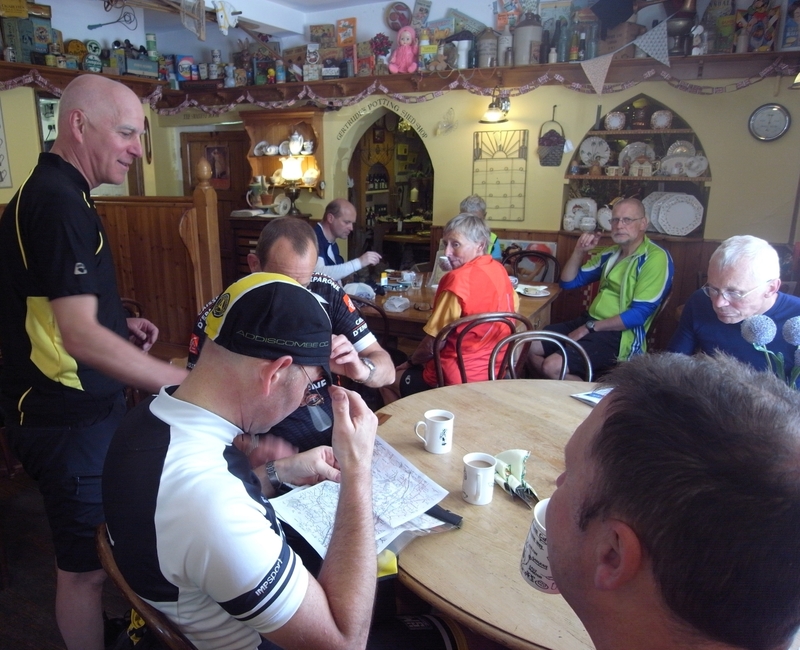 More lanes and an improvement in the weather and we eventually reached Powburn for a much needed cuppa and quick slice of cake. Once again we opted for the easy main road option (8 miles) instead of the hard man’s option of lots of very minor lanes and tracks. And so finally to Wooler and our celebration dinner. It would be lovely to have some photos of this section but sadly… the weather was rubbish and the camera was already damp enough! 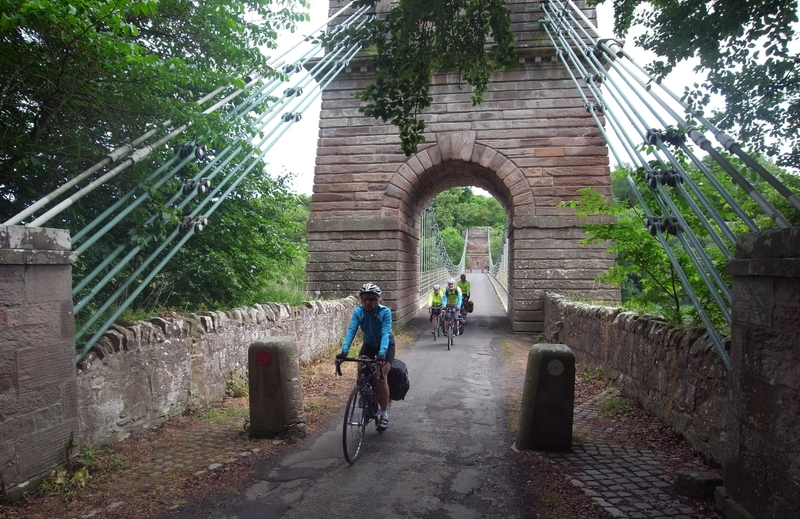 Day 8 is short as we head east for the coast at Berwick. It’s not without its interest, this section, but it’s always an edgy sort of day as people worry about getting to their trains. 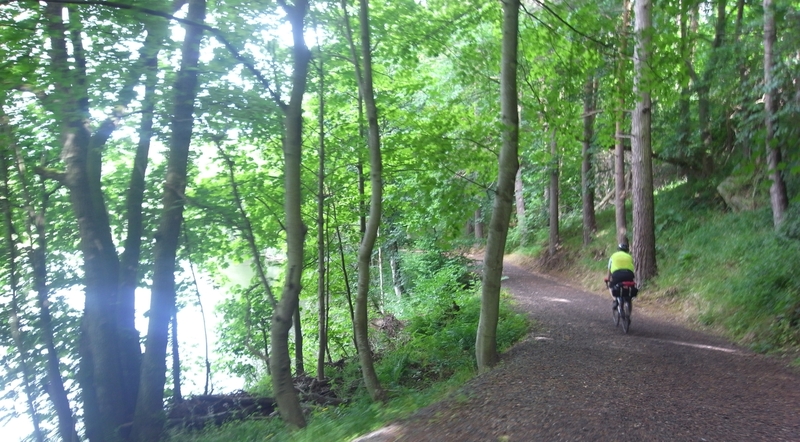 There’s a very attractive off road section which runs alonside the river Till – attractive that is until you have to push your bike up the hill at the end of the track! There’s refreshments available at Norham at the Butcher’s shop, after which it’s a relatively short run into Berwick, although Sustrans takes you round the houses and over the Union Bridge into Scotland for a brief while. All in all, it’s great to get to our final destination and a feeling of contentment at having completed such a great route. When will the 5th trip be, and might we mix things up by doing a N to S run? Sounds good to me! As a long time bicycle tourer and photographer, I had an early vision of such a site, though little knowledge in how to make it happen. I had no doubts that it would be big, but surprisingly no one I’d talked to gave it much of a chance. In the end, I taught myself how to create a webpage and with 7 images I had the first pages created. To shorten this story; the website took off, going worldwide in short order by word-of-mouth. Very quickly hit counts drove the site to the number 1 result for Touring Bikes on Google.com in any language. Over 10 million hits in just a few years. 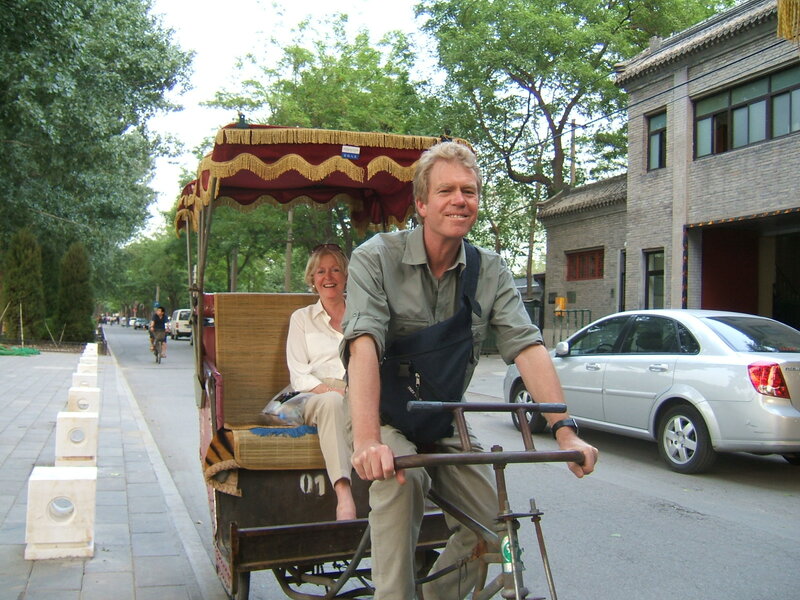 Send a message to CycleTouringINF if you succeed in getting your trusty steed added to Ron’s site. The shot below simply isn’t good enough (but I like it anyway). You could even send your loaded bike photos to me too, but include yourself in it – we’re not going into competition. Sort of like the shots you find here, but some background scenery would be an added bonus. Here are some reports of a 500 mile bike ride down the Mississippi River from its source to Dubuque, Iowa. It’s nice folksy tale which you should pass on to anyone who thinks that undertaking something of this magnitude is just for the tougher types among us. 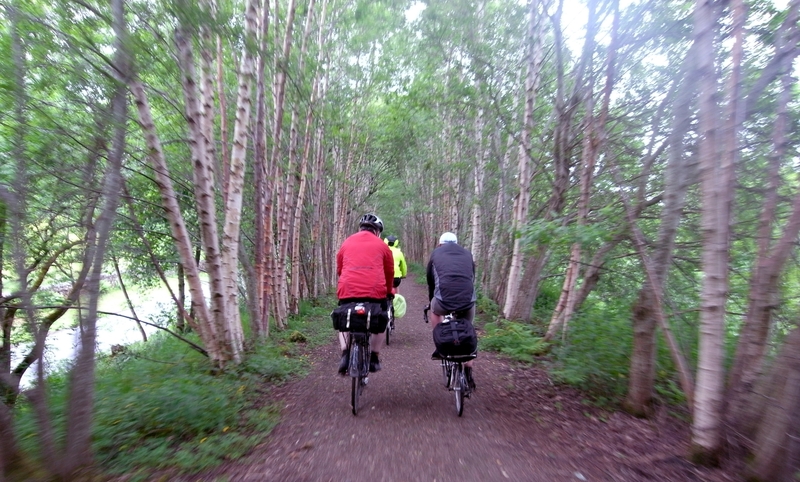 If every reader of this blog were to persuade a cycling, but non-touring friend to do a ride along a river, from source to mouth, we might get a lot more people cycletouring. River suggestions: River Test (Whitchurch – Southampton), River Severn (Newtown t o Chepstow) , River Trent (Biddulph to Humber Estuary), the River Thames etc – the choices are endless. Over the course of the next few weeks tour programmes for next year will be released by CTC, not to mention numerous other tour companies. 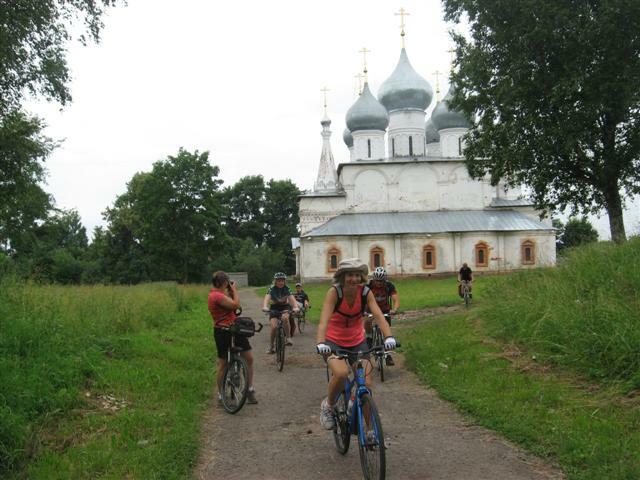 Adventure Cycling already have theirs out; our old friends, the Russian Cycle Touring Club, have just been in touch to advise us of their tours next year. CTC members receive a 10% discount. Mark, some more rally info. I also know that the Germans and Danes have annual rallies but I do not know any web-sites for them. 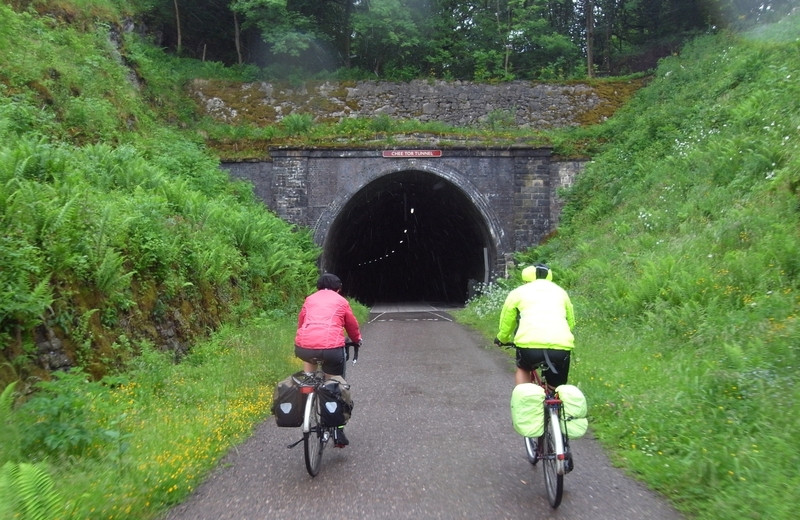 All over Europe, including the UK with its Birthday Rides, there are excellent weeks of well organised cycle touring organised by experienced club members in many countries. Anni and I took part this summer in 2 rallies and have enjoyed others in the past. 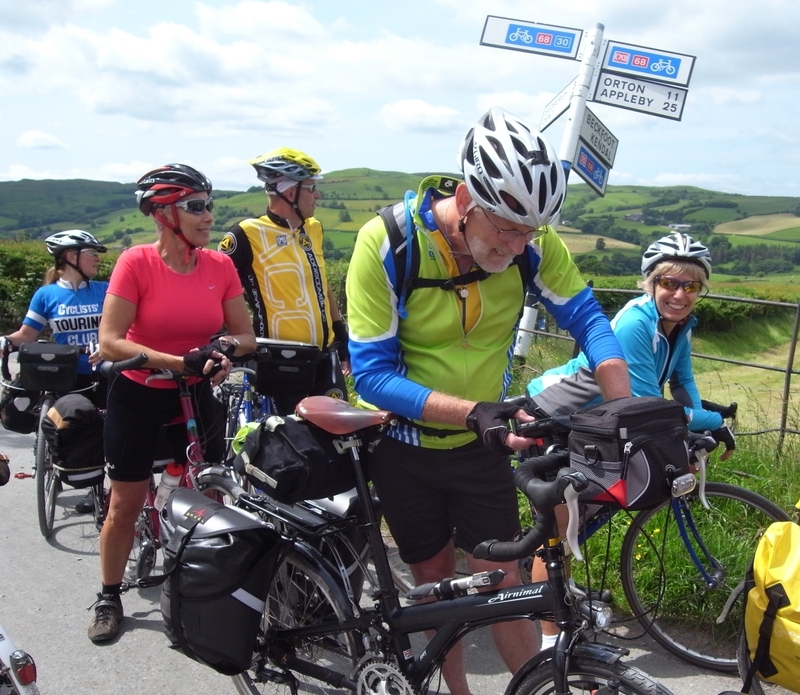 The 67th AIT international rally ( held in the Ardennes ) began on 16 July for 7 days, opening with a ride around the host town followed by snacks and wine plus a parade of old bicycles. 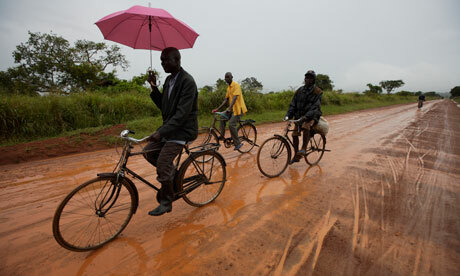 Daily rides at 4 distances between 43 and 125km were held in parallel with off-road rides. One day there was a hog roast picnic for everyone. On our return each day, there was a large TV showing the Tour de France, beer and tasty 3-course dinner with wine followed by music, dancing and more beer including the special beers for which Belgium is justly famous. 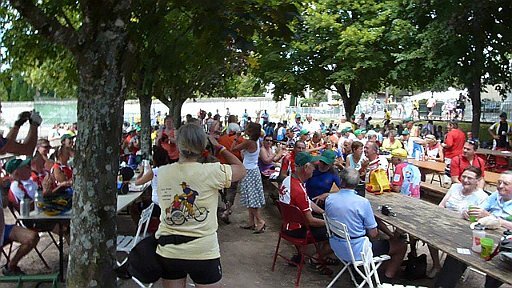 The full programme can be viewed on http://www.cyclo.marche.be/ In other words a very sociable week enjoyed by over 1300 cyclists from 14 countries. Although there was some rain, how lucky we were in that it generally stopped 5 minutes after our return to the H.Q. The Swedish rally was held in the Central Southern area and followed a similar format. It was not quite as sociable but the very quiet routes certainly made up for the lack of lively evenings. Organised walks around Boras’s town sculptures, visits to old textile mills and free tickets to a first division team’s European match filled our evenings. See more on http://www.ctv2011.se/ A highlight was the first day when 2 hours passed without meeting a vehicle on Sweden`s quiet ways. The Swedish Rally in 2012; 29 July – 4 August, 2012 is in Varberg, south of Gothenburg on the coast and quite accessible from UK. www.cykelframjandet.se/ varberg and www.varberg.se . The Swedish rallies are on very quiet roads/ bridleways but as a rally , are less sociable than the AIT. You make your own entertainment in general. There are 3 and 4 day mid-week rallies in Holland from May to September. Details can be found on www.fietsengeniet.nl. Distances approx. 30,40,60 and 100km daily. Inexpensive. 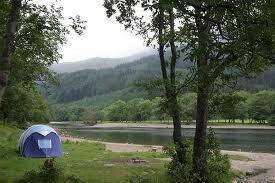 Camping and other accommodation possibilities. Info in Dutch but should not be hard to work out . We did a few evening rides when working there. All well organised, informal and jolly. Nice and flat. If I was a plagiarist, I certainly wouldn’t be admitting to it, but one has to get ideas from somewhere, and where better than Adventure Cycling’s Bike Bits which is similar in nature to Cycle Clips. In a recent issue there’s a piece about a good new hostel in Berlin called the 3 Little Pigs, conveniently located near the heart of the city, just a couple of blocks from the Potsdamer Platz. 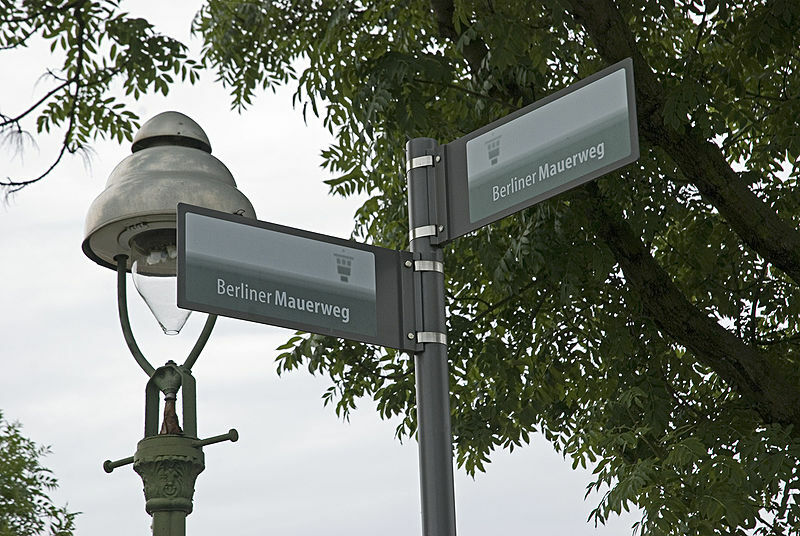 This is where you can start your 160km ride of the Mauerweg or Berlin Wall Cycle Tour. It is by no means all urban either, in case you were thinking that this is a bit of a wacky suggestion for a touring blog! Winter has all but set in, but the mild weather is still with us so what better time to take yourself off for a week to a new and (by all accounts) fantastic destination, not just to mooch around the museums and tourist sites but to do a spot of cycling too. Google ‘Berlin Wall Cycle Tour’ for everything you need to know. On the first google page alone, there are links to a Bikely route, a Bikeline guide, accompanied tours by bike and a whole lot more.